This soup is like putting a loaded baked potato in a blender! Be sure to cook everything in the same pot so that the bacon flavor can infuse through. If you use low-sodium broth you may want to add salt, but otherwise this needs no seasoning. Pierce potatoes several times with a fork to create steam holes. Place in a circle on a microwave-safe plate and microwave until cooked through and softened, 12 – 14 minutes depending on your microwave. Thinly slice the scallions, greens and whites. Set half of the sliced greens aside. While potatoes are microwaving, heat 2 tsp of evoo in a large saute pan over medium heat. Cook bacon until it is browned and crispy. Remove from pan and roughly chop. Divide the chopped bacon in half. Add the final tsp of oil to the pan. Cook scallions 2 – 3 minutes, until softened and slightly translucent. Remove from pan and reduce heat to low. Melt butter, swirling to coat the bottom of the pan. Sprinkle flour into melted butter and whisk vigorously to combine. Cook the roux over low heat, about 3 minutes, to remove the raw taste from the flour. Carefully add the milk to the pan. Whisk vigorously and make sure there are no lumps. Raise the heat to medium and bring mixture to a low simmer. Stir in broth. Use a fork to roughly mash the cooked potatoes. Carefully add mashed potatoes to pot and cook 3 – 5 minutes, continuing to mash the potatoes with your spoon. Stir in cooked scallions and half of the chopped bacon. Remove the pan from heat and stir in sour cream. 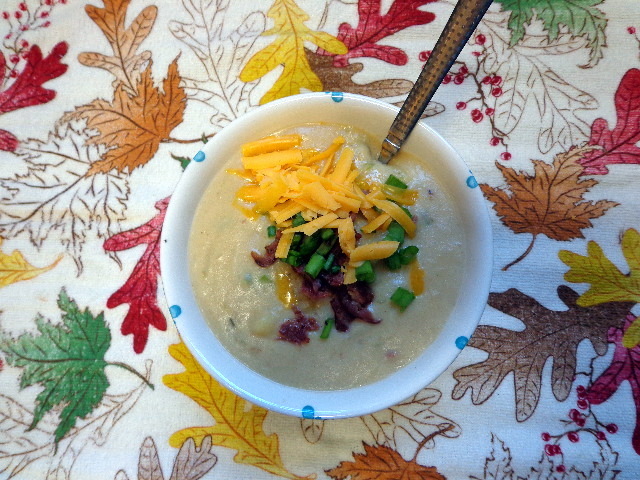 Divide the soup into four bowls and top evenly with cheese and reserved bacon and scallions.